Vintage 1965 photo of Lorenzo Bandini at Le Mans. 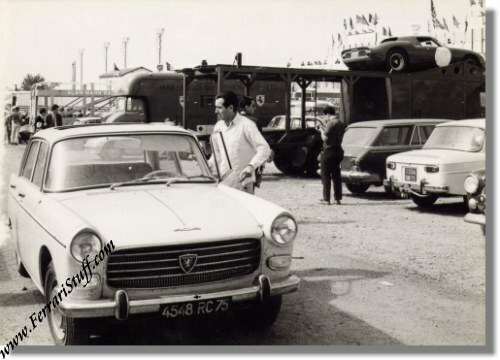 This is a vintage photo of Lorenzo Bandini in the paddock of the 24 Heures du Mans prior to the 1965 race in somewhat humbler transportation than one would expect... a Peugeot 404 Berline in this case (presumably a rental as the license plates shows it is registered in Paris). In the background we see the trucks of Maranello Concessionaires from England with the Ferrari 250 LM (S/N 5895) still on top of it. Lorenzo would drive the Ferrari factory entered Ferrari 275P2 (S/N 0832) together with Giampiero Biscaldi but unfortunately had to retire the car after 221 laps with valve problems. The photo measures some 12.5 x 9 cm or 5 x 3.5 inches.